If you start a sale and add products or a customer, but have not yet gone to the payment screen, you can put the sale on hold and return to it later. The customer and product data is maintained even if you process other sales transactions and come back to the transaction later. NOTE: You can't put a sale on hold after you click Check Out to enter the payment screen. From the payment screen, you can either click either Go Back, which results in an owing invoice if the sale is not processed or voided immediately, or Void to delete the sale completely without resulting in an owing invoice. To put a transaction on hold, click the Hold button in either Scan or Button Mode. 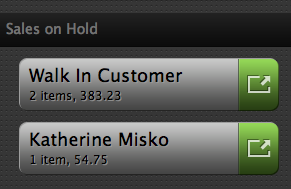 Product and customer information on the invoice is saved and accessible in the Sales on Hold section of the POS. Click the to re-activate the transaction and complete the sale. If you are in the middle of a transaction when a held sale is re-activated, you can discard the current invoice or to hold it. If you leave the POS screen, held sales are discarded and must be re-entered.